Ever wanted to know how many trainings your players have attended? Or games? We certainly have - and these statistics are already trapped in the teamstuff / coachstuff eco system somewhere. So let's show you how to get them out easily. OK, the first point to make is that there is only one set of attendances ; and you can see them from teamstuff and from coachstuff. Parents and players can set their attendance themselves for both games and for trainings ; just as coaches and managers can override them. In coachstuff, the review game and review training wizard also allows you to make sure this information is accurate. 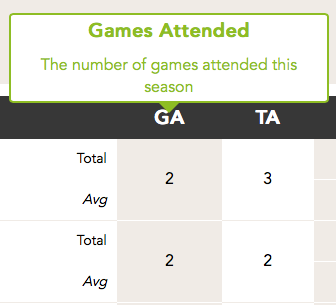 In the example above, I want to see the total games attended, and the number of trainings. Just remember too that these statistics are for the chosen season - look top right to search for other seasons.